Hoodoo Gurus (sometimes just shortened to 'Gurus') are an Australian rock band which used influences from seventies power pop, bubblegum pop, Beatle-esque harmonies, psychedelia and grungy garage rock. 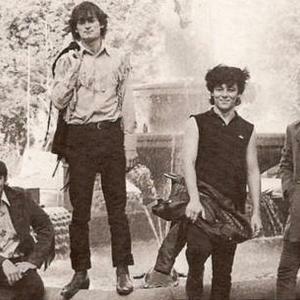 They formed in Sydney in 1981. Dave Faulkner, Rod Radalj and James Baker were originally from Perth. Baker and Radalj were original members of The Scientists, Faulkner and Baker were also members of The Victims in 1977-79. The original lineup band was notable for having three guitars and no bass player, creating a distinctive, layered sound. They were originally known as Le Hoodoo Gurus, but they soon dropped the "Le". The fourth founding member, Kimble Rendall, left in 1982, before the release of their first single, "Leilani" and went on to become a noted music video director; he was effectively replaced by Clyde Bramley. Radalj was not happy with this and left the band and was replaced by Brad Shepherd, (ex-Fun Things guitarist) who had been in Bramley's previous band. Radalj went on to perform with a number of other acts, including Love Rodeo. Hoodoo Gurus officially split in 1998, but have reformed occasionally for concerts. In 2004, they released a new album, "Mach Schau" and began touring again. The song "Come Anytime" is the theme song to Australian TV show Thank God You're Here. They also performed live in the pre-match ceremony to the 2006 NRL Grand Final. The Gurus are currently touring in 2007 including several US dates.